Every fall members of the Rotary Club of Ottawa take boxes of beautifully illustrated dictionaries to grade 3 classes in our city, specifically to schools where books and especially dictionaries might not be readily available in the home. We talk to the students about Rotary, its 4 Way Test which always resonates with them, and the kinds of projects we might be involved in here in our community and also internationally. The looks of delight as the students receive their dictionary and print their name in it are what make this visit to the schools so worthwhile. We practise using the dictionaries and then students crowd around to sign each others dictionaries on the “autograph” page inside the front cover. There are always many thank you’s from the students and the teaching staff at each of the four schools. 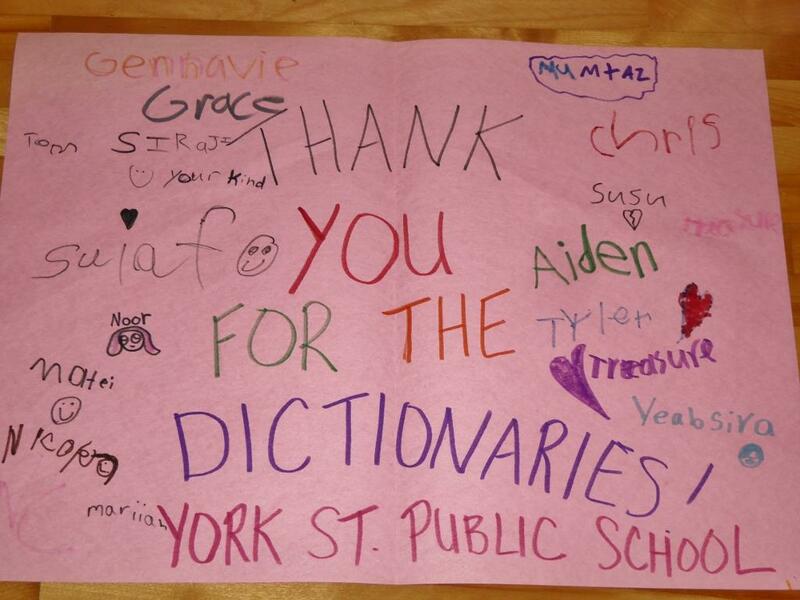 This year, we were surprised with a large thank you card from the enthusiastic class at York Street Public School. Our thanks to coordinator, John Lark, for his scheduling skills and to Rotarians Rich Fisher, Angela Kelly, John Lark, John McCalla and Don Rogers, for presenting the dictionaries.